Today we will setup a Distributed-Replicated GlusterFS Volume. 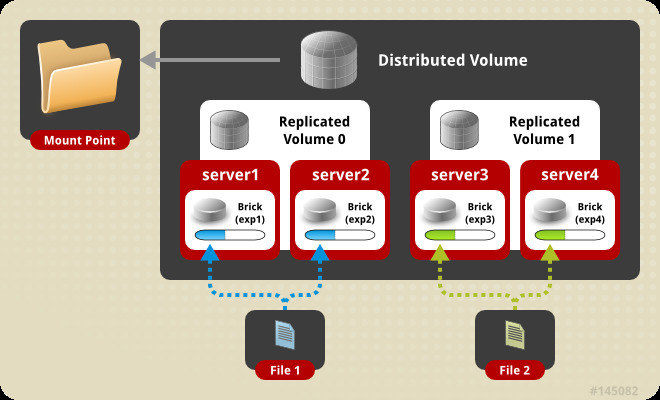 Distributed Replicated Volumes is when data is distributed across replicated sets and they are great when you need data redundency and scaling. So ideally, you can have 4 nodes in your storage cluster, consisting of 2 replicated sets, where a file is replicated between 2 nodes (having a replication count of 2), if one of the nodes goes down, you still have access to your file as the data of that particular file is replicated. In this case, I will only be using 2 nodes with 2 disk drives each, having node-1 disk-1 forming a replica set with node-2 disk-1, etc. Back to our 1st node, let's create the Distribute-Replicated GlusterFS Volume gfs with the replication count of 2. Let's test the data replication, when we copy data to our volume.